The waterproof Downtown2 QL3.1 is your trustful companion in daily life. The 20 liter volume main compartment takes everything you need for a day in the city: your kids‘ drinking bottles on the way to kindergarten, your presentation for work or your laptop for today‘s business meeting, this briefcase will handle it all and offers safe storage for all needs. A padded laptop sleeve for notebooks up to size 15.6", an organizer with two zippered pockets, a pen holder and a key snaphook keep things tidy. The Quick-Lock3.1 mounting system allows even more comfortable and quicker mounting of the pannier. Simply insert into the lower mounting element, move towards the rack and slide into the top hooks by a lateral motion from left or right. The hooks lock automatically and disengage by lifting the bag. The QL3.1 mounting set features three attachment points and can be mounted to any standard rack. Height and angle are individually adjustable. The mounting components on the bag‘s rear side are flat leaving the bag‘s back uncluttered, ideal for use in daily life. Convenient features such as the fold-down flap which is adjustable in height, the stable shape and base feet assist in making loading easier. 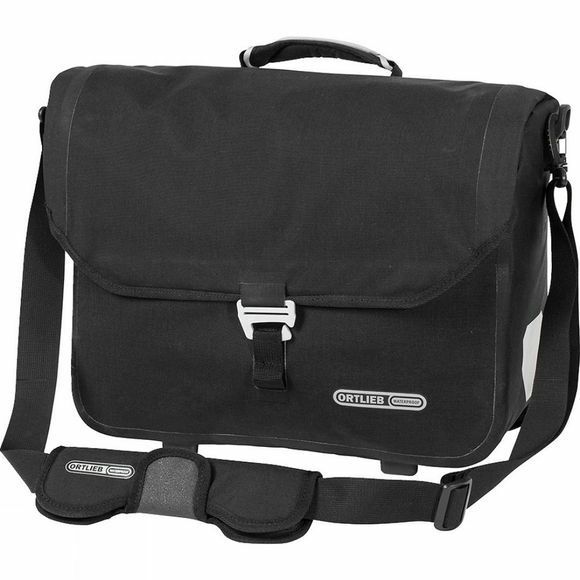 With a padded shoulder strap the briefcase can be comfortably carried for walking. A subtle elegant bag which does not reveal at first sight that it‘s actually a bike pannier. Downtown2 QL3.1 is manufactured in Germany and is offered in two material versions: a PVC-coated polyester fabric or a PVC-free Cordura blend.